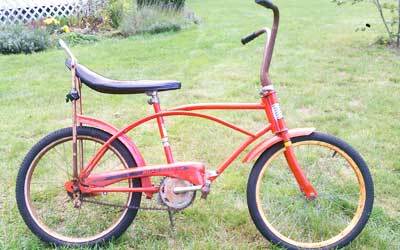 Over the weekend I picked up a complete, original 1971 Iverson Road Runner, a classic rat rod bike style that brought me right back to my childhood days on a banana seat Schwinn my dad repainted and named "The Streaker." This Maine barn find is the coolest thing. Stickers on the double-crown fork give it the look of a sprung front suspension. Ape hanger bars are each mounted in their own posts, affording maximum flexibility in positioning the bars. The chainguard is in great shape, and both fenders are solid, original, and nearly perfect. Sure there's rust all over the chromed bars, the rims, and even the chainring. And the foam in the seat is, well, nonexistent. But the seat has no tears in it and the tires held air when we got it home and pumped them up for a test ride. Why did I get this thing? Over a couple weeks, I had been eyeballing it beside a barn during my commute. It looked like it was going to the trash, but I couldn't tell for sure. Jess could tell that it pained me to see it out in the weather. When I saw the homeowner outside, I pulled over, made some inquiries, and loaded up the bike (and one more that isn't nearly as cool). I'm not sure what I want to do with the bike. It's an excellent resto candidate since it is, quite literally, complete. But I almost think it's just more fun the way it is. For now, it's just really cool to see my own kids taking a spin on the kind of bike I rode back in the day. This summer we finally made the move to Maine. After a year of weekly 500-mile commutes, we threw in the towel on selling the house, rented it out and made the move up to Maine. It's a wonderful thing! One of the first things our daughter Emma wanted to do was make jam with the berries growing all around the property. She and I collected about a half gallon of black raspberries one morning. The next morning we got up early and started cooking. Amazingly delicious stuff! What a simple, yet pleasant experience. Walk around the yard with a bucket, pluck ripe fruit, boil it down and add sugar, seal it in jars, and spread on a good toast. We're about done on the blueberries since the season is almost over. But the raspberries look like they'll be ripening for a couple more weeks. Perhaps another batch is in order. And we'll need it since the kids insist that we mail a bunch out to family. 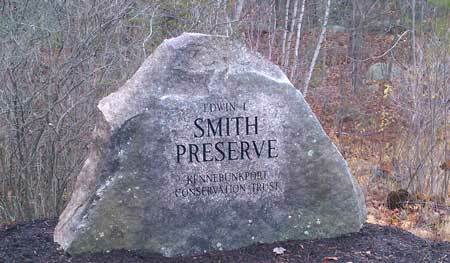 As I suspected in the fall, Smith Preserve is a beautiful, local winter getaway. The trails are frequented by cross country skiers and hikers alike, and it is a beautifully quiet place to spend an hour or two. I strapped on snowshoes a couple weeks ago during a deep freeze. I found solitude, crisp air, and frozen streams. This week I took another late afternoon/early evening hike in Smith. As I rounded the bend on a loop I've been taking an owl flew right across the trail, landing in a tree about 50' from the trail and 20' off the ground. I dropped my poles and headed off into the woods to see if I could get a closer look. Amazing! The owl was both completely aware of my presence the whole time and undisturbed by my effort to get close. I stood under the owl and we stared at each other. I took about a half dozen pictures with my phone, though darkness was beginning to set in and so it was tough to get a nice shot. Smith Preserve is proving to be a really sweet spot. It's halfway between home and office, and it's position on the commute makes it ideal for a quick trip into the woods. I found another nice set of bike trails in the area. Mt. Agamenticus is a cool mountain in York at the heart of "one of the largest remaining expanses of undeveloped forests in coastal New England" (http://www.agamenticus.org/index.html). On Sunday I rode the trails that head to the mountain peak. It's only about 30 minutes away from my place, making it fairly easy to ride. Perhaps the coolest thing about this ride is the bonus view from the top of Mt. Agamenticus. A lookout on the north end of the mountain offers views of the hills and valleys of Maine and New Hampshire, and I could see the Presidential Range in the White Mountains of New Hampshire in the distance. (A panoramic sketch of the mountain silhouette helped me locate those mountains, taking me back to the days when I used to hike those mountains all the time.) And from the southeast side of the peak I could see the Atlantic ocean. This will be a great place to ride as the leaves turn, and as they drop and the views just open up. This is a great place for hiking as well. On the summit, at the ranger station, there's a wonderful nature exhibit, with hawk wings, pelts, and plants that introduce visitors to the wildlife of the region. I'll bring the family here soon! It was such a nice ride that I headed back for more on Monday evening. I met Rob, a local Ogunquit bike shop owner, at the trail head. He offered to show me some of the trails I hadn't yet explored. We had a really nice, quiet evening ride as I explored the northeast end of this conservation area. After running around Ring and out around Second Hill, we rode straight up the north side of Agamenticus on Sweet Fern. We hit the summit just as the sun was setting over the mountains to the west. Gorgeous! I don't normally ride with a partner these days, unless I'm riding with my kids. It was great to have someone to ride with and I'll be sure to try to ride with Rob again. Apparently, there's another network of trails in a water district conservation area just across Mountain Road. Rob and I agreed that it would be nice to explore that area some other time.